The protagonist of this adventure isn't Gordon Freeman. Hell, he isn't even the hero, unless you think the good guy just holds the gun. Paranoia is a horror story and you're the monster, a scientist suffering from a psychotic break who orchestrated the murder of his boss using research technology if the gibbering narrative is to be believed. It seems like Rex is attempting to establish a character suffering from paranoid schizophrenia. You chafe at your inevitable incarceration and then plan a daring escape to exact your revenge on the facility, letting loose the experiments and anticipating an epilogue of drinking and womanizing, a coda that seems tailor-made for fellow FPS heartthrob Duke Nukem. 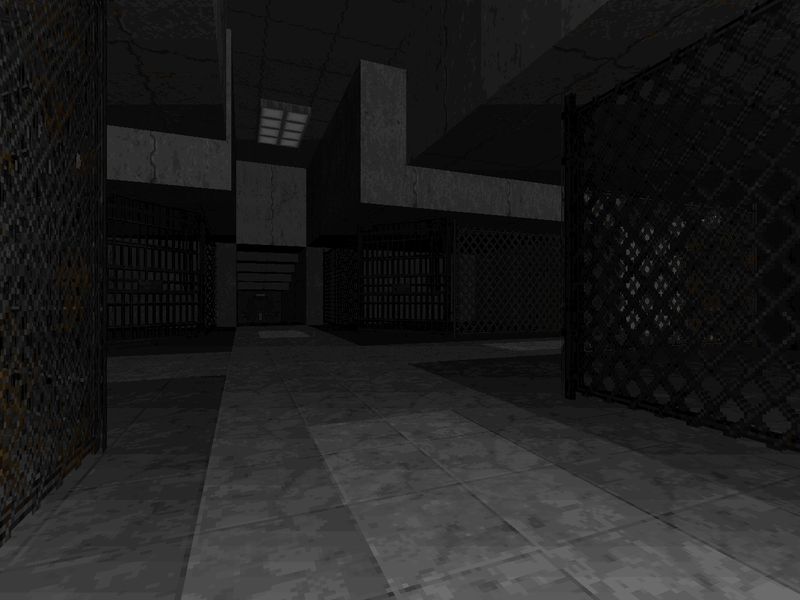 Paranoia's level design aims at realism as befits a mapset using Half-Life's resources. 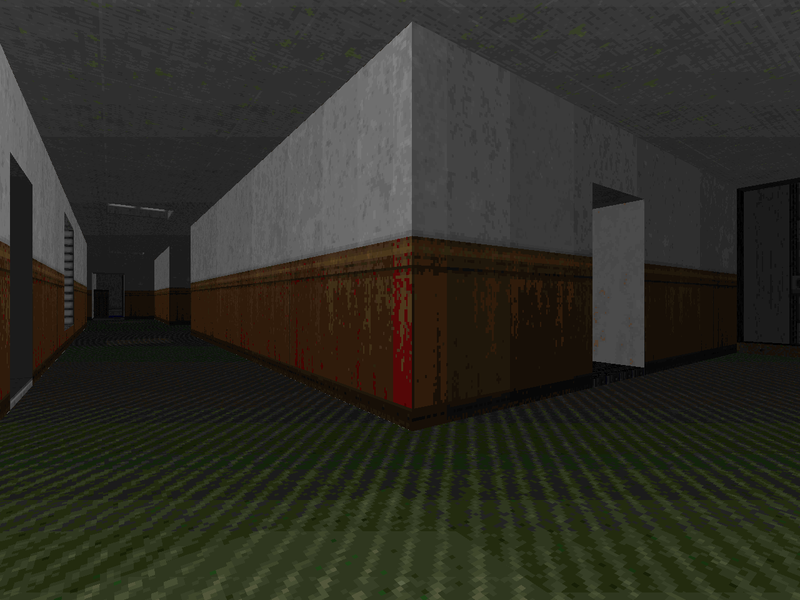 You'll battle through military barracks, an office complex, a hub of various and sundry labs, the bowels of the research installation, and finally the experimental holding pens where the player character laid his sinister snare. I would say that Rex does a much better job at making these spaces look interesting except for maybe those rows of nearly identical offices in MAP03. 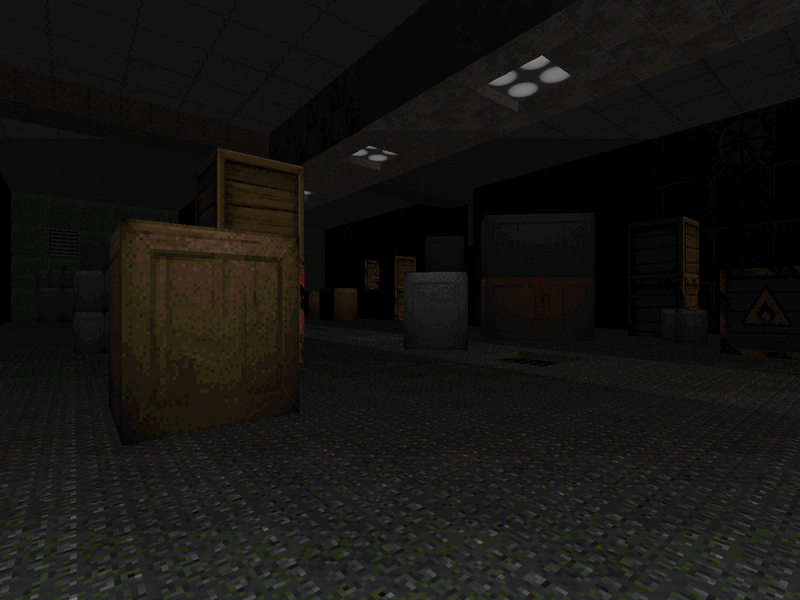 They may not always be the most action-packed experiences - Doom's monster design and AI hardly lends itself to thrilling combat when dealing with a ton of tiny rooms - but I was surprised by the natural progression of the last three levels, especially the variety of architectural set pieces shown in "Research Labs". Speaking of monsters, Paranoia does zilch to the actual monster behavior. 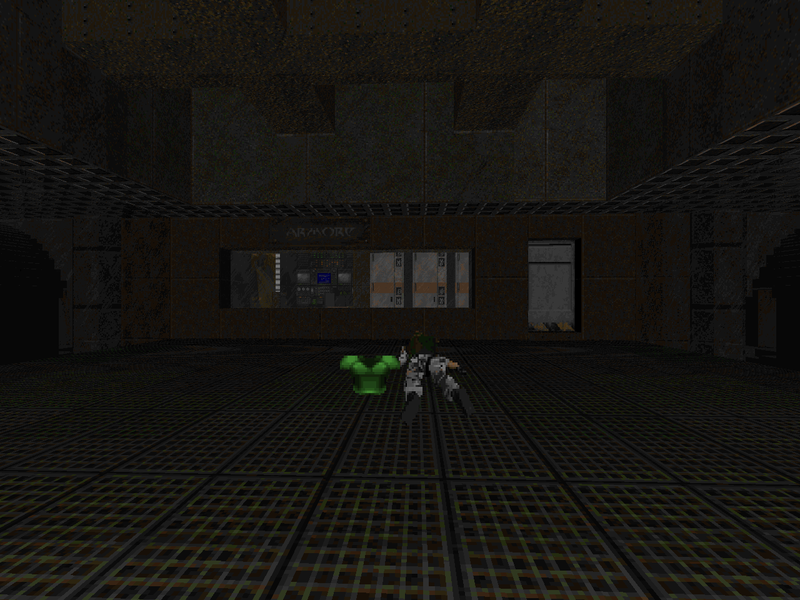 Instead, the resource pack matches up Half-Life's actors to the closest Doom II equivalent. Sometimes it works surprisingly well. I imagine that the majority of reactions will contain some level of bemusement, though, especially if you're at all familiar with the original Half-Life. The zombiman, shotgun guy, and SS Nazi have all been translated to marines; the commando becomes the beefy alien that shot those homing flies. I think there's a sound mix-up since the Nazi / soldier alert noise sounds more like a screaming pod person and the commando / alien having human effects, but I guess you could rationalize it by blaming it on HalfGuy's delusions or an actual, factual replacement invasion. None of the soldiers are all that interesting to fight. Zombies are slow, relatively inaccurate shooters, and pretty flimsy except for the Nazi replacements which feel like an inverse jackpot whenever you find one. Paranoia is way more interesting when the monsters get involved, even if things feel weird based on their "altered" behavior. The headcrab zombies replace the imps and summarily can fling fireballs. Houndeyes slot in for demons, lacking their shockwave blast. Headcrabs, as I remember the least durable monster, become lost souls. This kind of works but also manages to be DoomCute when they end up flying and bouncing around. The meditating alien replaces the cacodemon, working out okay. Less so the bullsquid; I recall them being strong but not Baron of Hell durable. The gargantua rounds out the available monsters in a pretty good translation as the Cyberdemon, giving the action a decidedly Doom feel since the only appearances of sequel exclusives are from zombie-related creatures. This may be for the best as the original cast did a pretty good job of supporting the science fiction / horror setting reinvented by Half-Life. However, I feel that Paranoia is at its best when you're facing the aliens. The marines are far too hamstrung to serve as anything but slightly frustrating cannon fodder, especially when the consequence of one of them sneaking up on you is slim to nil considering how bountiful health is. Even starting out with the pistol isn't much of a handicap vs. the legions of walking bullet and shotgun dispensers. Where Paranoia differentiates itself from, say, Rex's Phoenix Rising is in using ZDoom features in a more appreciable way to better mimic the mechanics of Half-Life. One thing he doesn't bother to explain is why you suffer damage in the sunlight outdoors. Having spent a handful of summer vacations in Arizona, I fail to see it being a climate issue. The security cameras aren't all that interesting to me but I like the variety of forcefields and computer consoles. The biggest things in my mind are the Health kiosks, which administer 50 HP of medical aid in 10 HP doses, growing dimmer with each use. 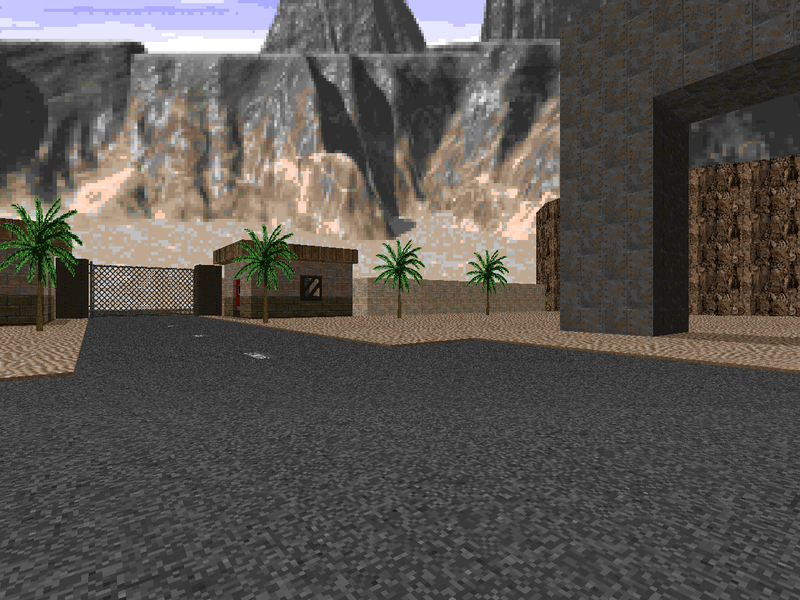 You'll also see a bit of swimmable water in MAP05 ("Utilities") and quite a bit of scripting from just showing you your jumbled inner musings to a climactic finale with several alien siege tanks and the base attempting to crumble around you. Paranoia walks these conscious design decisions back to their origin. Rex, however, does appear to be at least somewhat aware of the limitations of his chosen format. When attempting to ascribe some sort of motivation for the player character, he settles on insanity. After all, nothing so closely resembles Doom's zombie enemies as Half-Life's marines, and what rational reason would a scientist who previously worked alongside them have to murder them en masse? There's some restraint, though; the scientists and security guards only appear in posters when it would have been easy at least for the latter to replace the regular zombiman. You're conveniently left with Half-Life's original antagonists as targets for your murderous rampage. 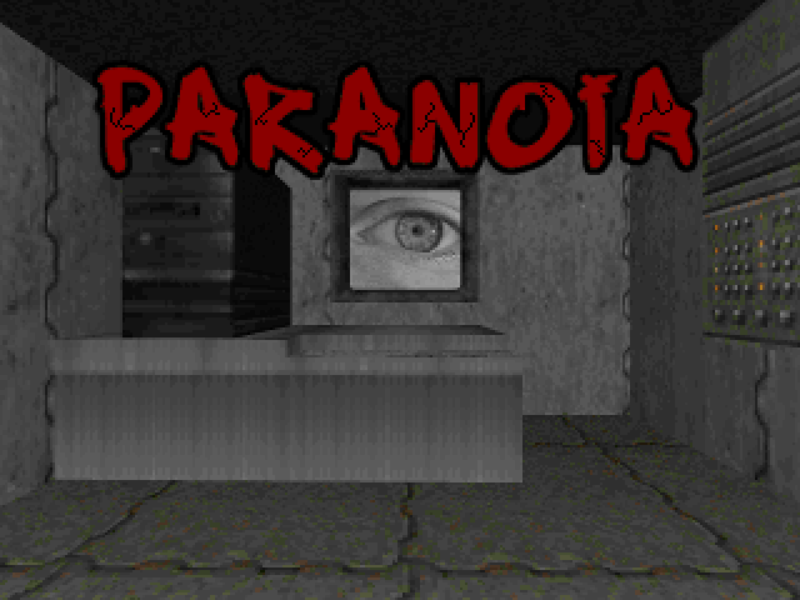 Paranoia is probably the best example of what Rex could hope to do in the year 2000 but I know that ten years of source port development separate it from its sequel, Paranoid. It might be a long time before I get there, but I'm interested in seeing how much further Rex managed to blur the lines between two then venerable First Person Shooters... not to mention Paranoiac, which isn't out at the time of this writing but might be whenever I post it. 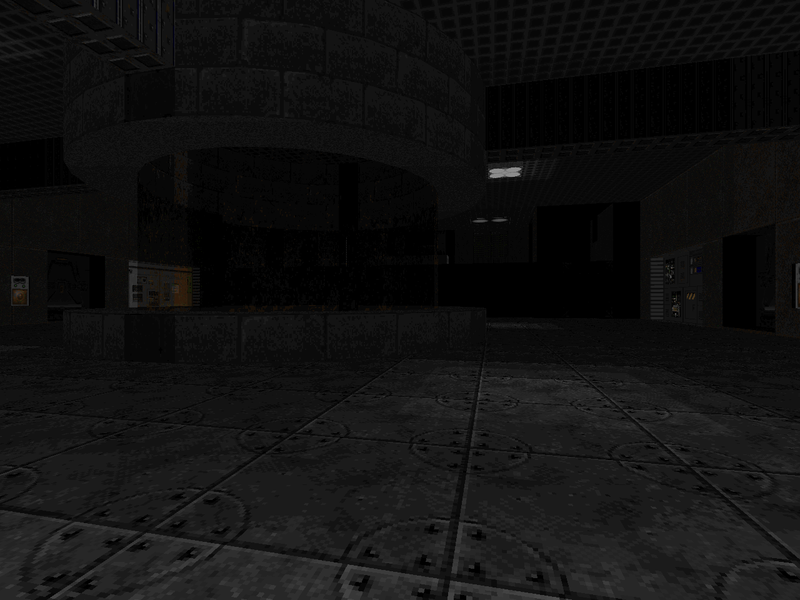 Paranoia does some cool things with scripting and is fairly novel as a Half-Life-flavored Doom II TC. Its level design, especially from MAP04 and on, battles the realistic tendencies pretty well even with occasionally lackluster encounters. 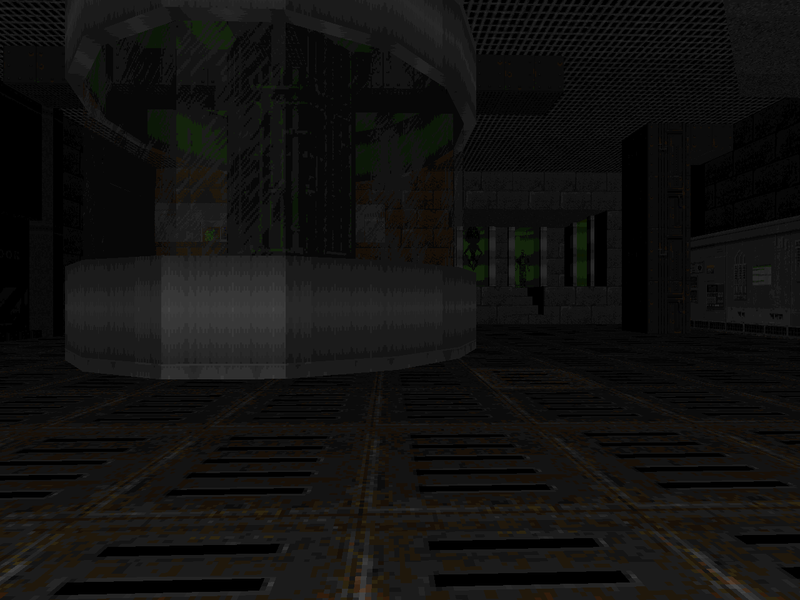 I think you ought to know by now whether or not you're interested in this re-skin. Me, I enjoyed myself. Looking forward to the next one, Rex. The facility's prison is adjoined to the military barracks. It's DoomCute to the core with tons of beds, computers, and a bathroom that if I'm not mistaken is copied from Military Research Complex. You're only up against plain ol' zombies though one of the varieties will throw you off because it's actually the slightly tougher SS Nazi. None of the fights stand out; they're just zombies, after all. 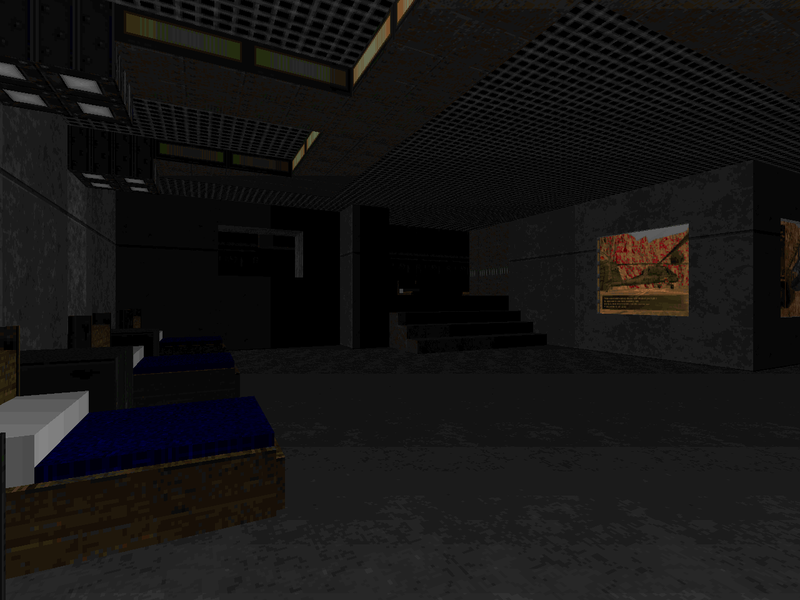 The more memorable areas include a warehouse, the armory (requiring the kind of secret blue key), and that northeastern curved corridor which helps to bust up the Doom realism. Well, I'll say this much: Rex certainly captures the feeling of an administrative office building. 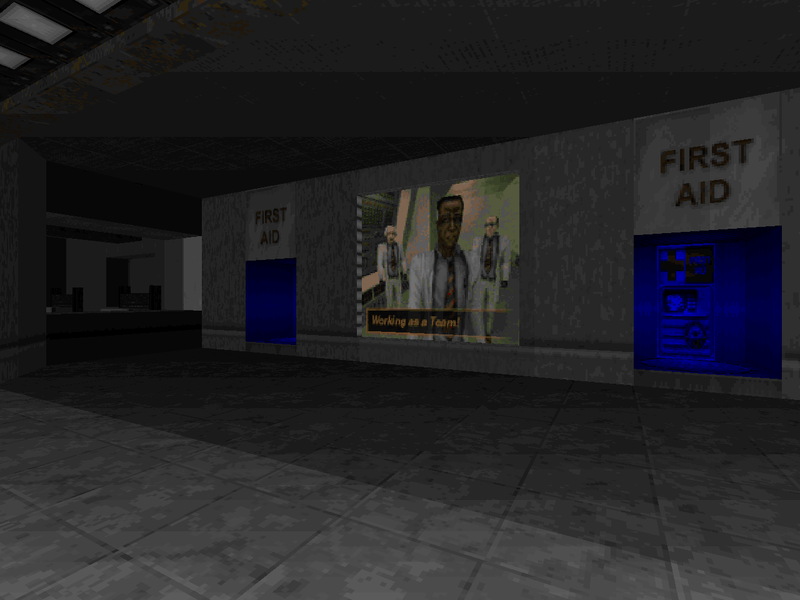 Unfortunately, where you get the impression that a lot of strange things can happen while going through the offices of Half Life, there isn't much to surprise in what is effectively vanilla Doom. As dangerous as we know its zombies are, the difference between their AI and Half Life's is staggering. Office building shootouts are not their strong suit. The way the creature replacements are worked in is good, though, especially the bit in the computer core where the head crabs come out of the vent ducts. The teleport fight against the houndeyes was another neat surprise. So this is a cool level based on a relatively banal octagonal hallway / compound featuring branching areas on all sides but the western has stuff like a medical facility, cryogenic storage, some kind of reactor, and other various labs. Similar to MAP03, it has the feel of two distinct phases: one where you clear out the soldiers and the other involving the liberation of all the alien specimens, now including replacements for the cacodemon, chaingunner, and Baron of Hell... plus a big showdown versus a Cyberdemon-behemoth thing. 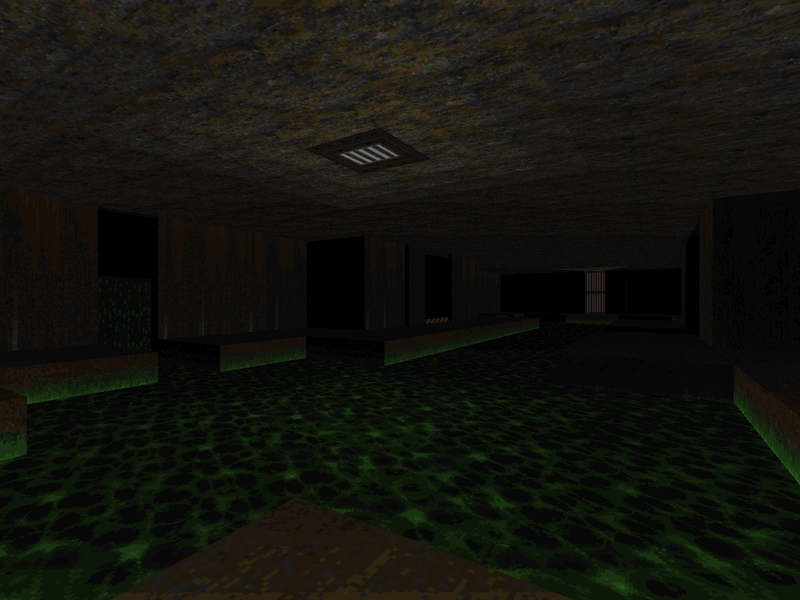 This is probably a pretty good target to shoot for in terms of attempting to mine Doom realism. Rex jams a bunch of disparate areas together but it works okay. "Utilities" is part crate storage, nukage tunnels and water treatment, the liquid itself, and another security fence. The entire journey is just one big loop to get into the initially inaccessible surveillance room at the beginning, a tried and true level design gimmick that works out pretty well for you since Gordon's luck would probably have him fall out of an air duct over waste processing and turned into shredded beefcake. The monsters have the run of most of the base, so the action's a bit heavier than usual, especially with all the bullsquid / Barons. The plasma gun isn't essential or secret but it's pretty easy to miss. 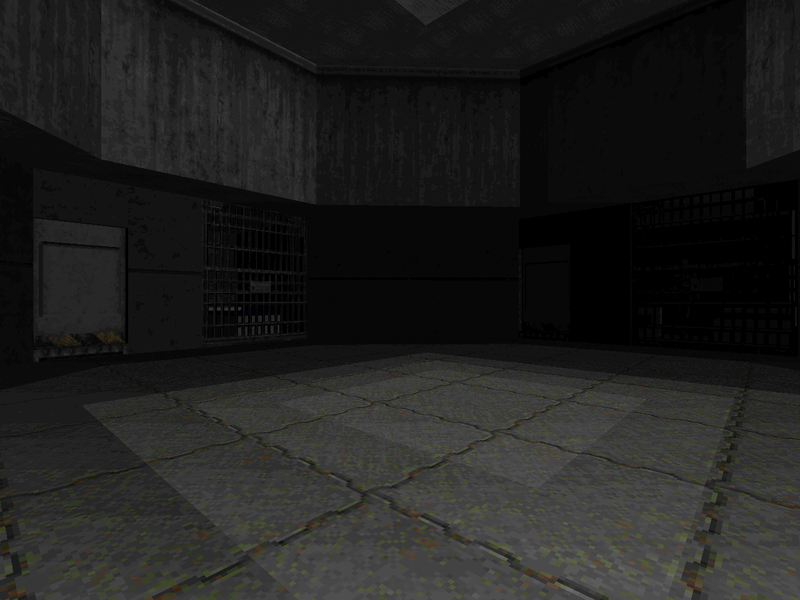 Doing so will turn the second half of the level something a lot closer to the survival horror of the source material. This level is something more of an action gauntlet that starts out in an eerily familiar slice of the prison area from Military Research Complex. After it moves on to the holding cell that got the mad scientist in trouble in the first place it turns pretty cool, continuing on to the concrete-encased forcefield chambers to the northwest. 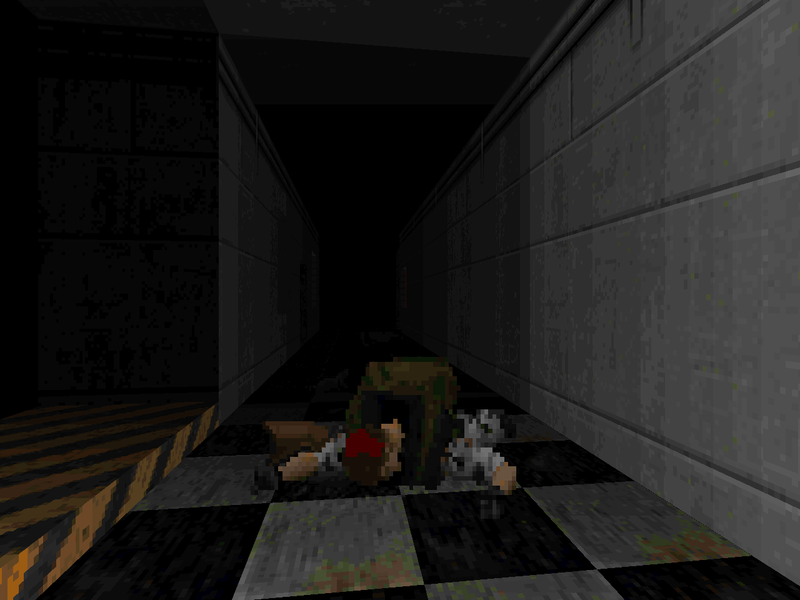 A hectic and sudden ambush follows and finishes with a two-stage behemoth showdown that is a little awkward considering the confines but should be cake for anyone familiar with BFG bumping... who admittedly might not be the target audience for a Half Life-flavored Doom WAD. It's nice to see scripting come to the forefront when it's been otherwise absent. Wow, it looks awesome, I must give it a chance. So...this is where ReX and Half Life mods was born. Despite taking 10 years to pump a sequel out.